Global Investigations Review (GIR) is a unique service analysing the law and practice of international investigations. With an established network of contacts, our dedicated team of journalists travel worldwide to provide you with everything an investigations professional needs to stay informed. Our service covers daily news on global enforcement actions and legal developments, alongside exclusive data, surveys and practical guides. Coverage extends to government agency investigations and internal corporate investigations of issues relating to international anti-bribery and corruption, financial services misconduct, antitrust, fraud, money laundering, tax controversy and more. In 2015, GIR joined forces with Just Anti-Corruption, an additional daily news service covering exclusive Foreign Corrupt Practices Act-related scoops and analysis, new and ongoing FCPA investigations, enforcement actions and investigation costs. Our team searches through all FCPA case dockets and SEC filings daily, appending documents to news stories covering relevant developments. GIR publishes independent, renowned signature surveys including the GIR 100: the annual guide to the world’s leading firms for corporate internal investigations. Other surveys include: The Due Process Guide, The Enforcement Scorecard, Women in Investigations and 40 Under 40. GIR produces practical guides that are aimed at helping investigators understand the perils and pitfalls that can arise when conducting internal investigations in different jurisdictions. GIR Live hosts events throughout the year in key jurisdictions on the main issues in investigations law. Each event brings together speakers and delegates from in-house, private practice, forensic consultancies and government authorities. Delegates will enjoy comprehensive updates, reviews of recent cases, practical advice and the opportunity to hear directly from authorities. Networking breaks, regular Q&A sessions, case studies and symposiums allow delegate interaction. GIR is the hub of the international investigations community. GIR Insight is an integral part of that. We partner with leading lawyers, forensics advisers, in-house counsel and enforcement agencies to provide more in-depth perspectives on the topics that we cover in our news, surveys and events. Annual regional reviews looking at hot topics and trends across Europe, The Middle East and Africa Region, the Americas and the Asia Pacific Region. Know-hows on the practical challenges of investigations, e.g. maximising privilege protection or financial services misconduct. These are questionnaire-based. The Practitioner's Guide to Global Investigations, our big book about how to conduct a cross-border investigation. 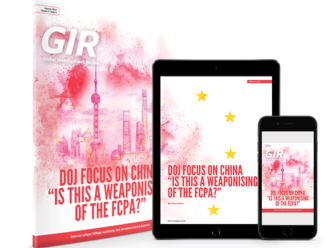 A subscription is required for full access to Global Investigations Review and GIR Just Anti-Corruption. For more information, please ­contact us. For daily news alerts, sign up for free to the news briefing. Published by Law Business Research Limited – an independent, multi award-winning publisher of research, data and analysis on international business law and international legal markets.